Photo taken at twelve months old Putz, along with his litter sister Estrik Peppermint Penny, do not feature quite as heavily as some of our other dogs do in Estrik Bouvier pedigrees. 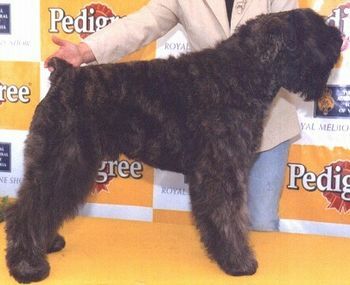 Putz is the sire of our "W" litter and our "Z" litter and with these two litters we are able to continue on. From the "W" litter both Estrik Winsome and her brother Ch Estrik Whiskey On Ice, owned by Rob Roostenberg in Cairns,will feature in the future Estrik Bouviers. From the "Z" litter we have huge hopes for Estrik Zaana both as a mother as well as an agility dog. She lives in her forever home in Melbourne and after her maternal duties are finished will, no doubt, take the agility world by storm.